Long before Ohio became a state in 1803, the northeast corner of the state belonged to the State of Connecticut. They called this territory their "Western Reserve" and the name as well as New England-style architecture, town squares, and customs can still be found throughout the area. A strip of land from the state of Connecticut going directly westward, from coast to coast, was granted the state by King Charles II in 1662. This strip included the northern edge of what would become Ohio, from Lake Erie to a line slightly below present-day Akron and Youngstown. In order to settle their Revolutionary War debts, Connecticut sold off all but their Ohio holdings shortly after the war. They retained title to more than three 3 million acres from the Pennsylvania line to what is now Huron and Erie Counties. The property, however, became somewhat of a "white elephant" and in 1796, Connecticut transferred the land to the Connecticut Land Company. 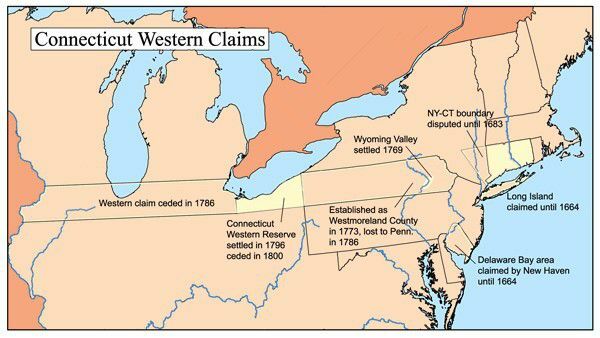 Upon the transfer of ownership, the Connecticut Land Company sent one of their surveyors, Moses Cleaveland, to the Western Reserve in 1796. Cleaveland charted the areas at the mouth of the Conneaut and Cuyahoga rivers and founded a settlement that would become Cleveland Ohio. The far western part of the Western Reserve land, today's Erie and Huron Counties, was dubbed "The Firelands", and reserved as homesteads for residents of New England whose homes were destroyed by fires set by the British during the war. The Connecticut influence is still seen today in Northeast Ohio -- in architecture, such as the homes of Chardon, Hudson, and other eastern Cleveland suburbs; in town squares, such as in Burton, Medina, Chardon, and others; and in names, such as Hudson's Western Reserve Academy, Cleveland's Case Western Reserve University, and University Circle's Western Reserve Historical Society.